8 October 2014. 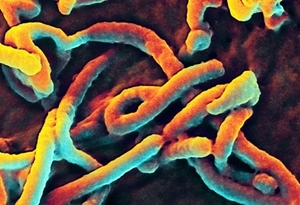 Researchers at University of Utah and Navigen Inc., both in Salt Lake City, designed a synthetic peptide acting like a protein found in all strains of the Ebola virus that can serve as a target when screening for potential drugs to treat patients with the deadly disease. The team led by Utah biochemist Debra Eckert published its findings online this week in the journal Protein Science (paid subscription required). The Ebola epidemic now spreading in West Africa is caused by the Zaire species of the virus, one of five species identified so far. While current research and control efforts are focused on the Zaire species, Eckert and colleagues are seeking tools that can help develop therapies for all types of the virus, to prepare for future outbreaks, or a weaponized version of the disease. Previous research by the Utah lab looked at mechanisms of the HIV virus to enter human host cells, and the researchers in this paper used that same approach with Ebola. The team designed a synthetic peptide acting like a natural string of amino acids that forms part of the protein the Ebola virus uses to enter and start infecting human host cells. This protein is found in and acts similarly across all Ebola species. The researchers tested the synthetic peptide as an marker for screening potential drugs to prevent entry of the Ebola protein into human host cells, with a phage display, a lab technique that identifies interactions among proteins, peptides, and DNA in a similar manner to natural processes. The tests show their synthetic peptide could act as a marker to find drugs that prevent the protein from entering human cells. Navigen Inc. discovers and develops therapies from synthetic peptides called D-pepides that act like natural peptides, but are more stable in the body and less likely to cause an immune-system reaction. The company has a library of peptides that it says can screen billions of unique peptide sequences for binding to virtually any target. Navigen has an exclusive license to the Utah synthetic peptide technology and is currently screening D-peptide candidates to find Ebola treatments.